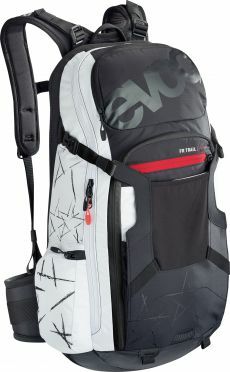 The Evoc FR Trail unlimited 20 liter backpack black/white is a technical daypack with integrated back protector for more safety on all trails. Offering superior carrying comfort and entirely neutrally balanced load distribution, the backpack enables unlimited freedom (of movement) when riding a bike. The Special Edition unlimited is a unique design concept, which was co-developed by Evoc's team athletes. As a little extra, this model has a handy hip belt pocket. 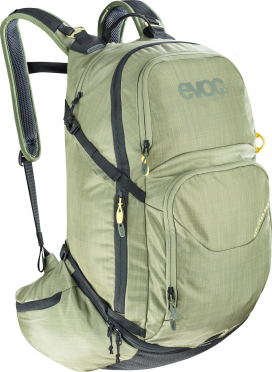 The Evoc Stage 6L + 2L bladder backpack olive is a compact, technical daypack with an hydration bladder of 2 liter which is enough for an intensive bike ride of 2 hours. The backpack has excellent features and configuration , it is the number one option for those looking to travel light without sacrificing carrying comfort and back ventilation. Extra convenience comes with the freely moving BRACE LINK, which adapts to the wearer's individual shoulder width. In the development of the STAGE SERIES Evoc has put great emphasis on creating backpacks with sophisticated technical features which provide optimal support, and at the same time form a unit with the bike rider. A secure, body-hugging fit and maximum air ventilation were the key focus, without the backpacks appearing overloaded. 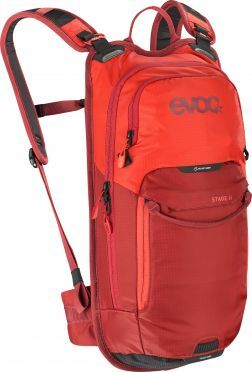 The Evoc Stage 6L + 2L bladder backpack red is a compact, technical daypack with an hydration bladder of 2 liter which is enough for an intensive bike ride of 2 hours. The backpack has excellent features and configuration , it is the number one option for those looking to travel light without sacrificing carrying comfort and back ventilation. Extra convenience comes with the freely moving BRACE LINK, which adapts to the wearer's individual shoulder width. In the development of the STAGE SERIES Evoc has put great emphasis on creating backpacks with sophisticated technical features which provide optimal support, and at the same time form a unit with the bike rider. A secure, body-hugging fit and maximum air ventilation were the key focus, without the backpacks appearing overloaded. 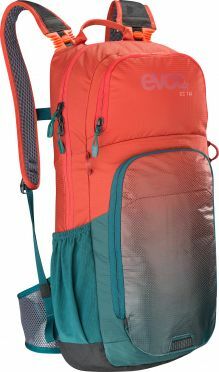 The Evoc CC 16 liter backpack red/green is the ideal ventilated, lightweight backpack for use in the mountains and in the city. The Air pad system ensures perfect ventilation of the back while the brace link on the shoulder straps guarantees a good fit. The many compartments complete the versatility of this backpack by ensuring a well-organized layout and ensuring that all the essentials for a successful bike trip. 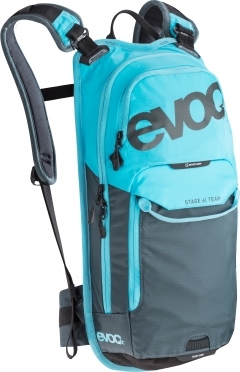 The EVOC Stage 12 liter backpack blue/loam is a compact, technical daypack with excellent features and configuration - the number one option for those looking to travel light without sacrificing carrying comfort and back ventilation. Extra convenience comes with the freely moving BRACE LINK, which adapts to the wearer's individual shoulder width. In the development of the STAGE SERIES Evoc has put great emphasis on creating backpacks with sophisticated technical features which provide optimal support, and at the same time form a unit with the bike rider. A secure, body-hugging fit and maximum air ventilation were the key focus, without the backpacks appearing overloaded. 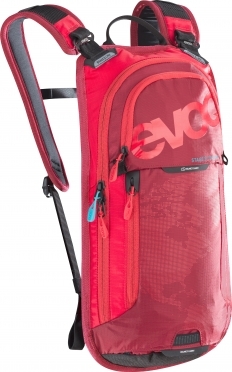 The EVOC Stage 12 liter backpack red is a compact, technical daypack with excellent features and configuration - the number one option for those looking to travel light without sacrificing carrying comfort and back ventilation. Extra convenience comes with the freely moving BRACE LINK, which adapts to the wearer's individual shoulder width. In the development of the STAGE SERIES Evoc has put great emphasis on creating backpacks with sophisticated technical features which provide optimal support, and at the same time form a unit with the bike rider. A secure, body-hugging fit and maximum air ventilation were the key focus, without the backpacks appearing overloaded. 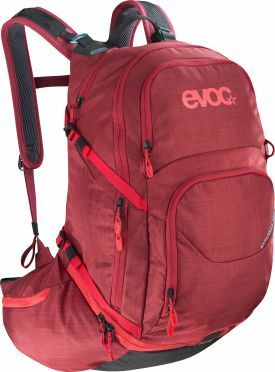 The Evoc Explorer pro 26 liter backpack red is a versatile bike touring backpack for unlimited adventures. With enough room for storage and a dialed compartment management everything you’d need on tour has its space, exactly where you need it. The Air flow contact system offers an outstanding carrying comfort through maximum back ventilation and absolute load neutrality. The goal is to prevent pressure points even when the backpack load exceeds the recommended maximum weight of up to 10 percent of your body weight, as well as to keep the contact points between body and backpack dry and comfortable. 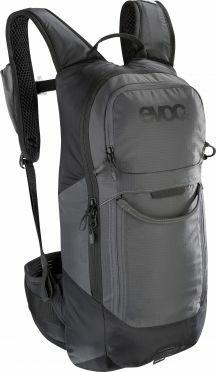 The Evoc Explorer pro 26 liter backpack black is a versatile bike touring backpack for unlimited adventures. With enough room for storage and a dialed compartment management everything you’d need on tour has its space, exactly where you need it. The Air flow contact system offers an outstanding carrying comfort through maximum back ventilation and absolute load neutrality. The goal is to prevent pressure points even when the backpack load exceeds the recommended maximum weight of up to 10 percent of your body weight, as well as to keep the contact points between body and backpack dry and comfortable. 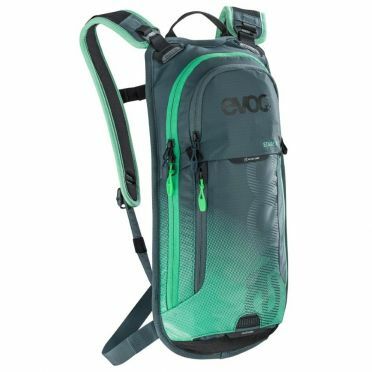 The Evoc Stage 3L + 2L bladder backpack green is a compact, technical daypack with an hydration bladder of 2 liter which is enough for an intensive bike ride of 2 hours. With a capacity of 3 liters, the backpack has little space for large items such as an extra pair of shoes or clothing, although the bag is big enough for spare parts, tools or food. Extra convenience comes with the freely moving BRACE LINK, which adapts to the wearer's individual shoulder width. In the development of the STAGE SERIES Evoc has put great emphasis on creating backpacks with sophisticated technical features which provide optimal support, and at the same time form a unit with the bike rider. A secure, body-hugging fit and maximum air ventilation were the key focus, without the backpacks appearing overloaded. 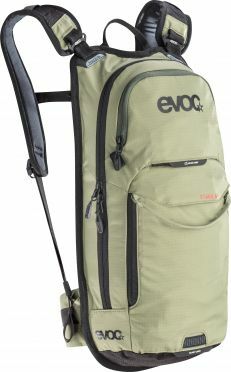 The Evoc Explorer pro 30 liter backpack light olive is a versatile bike touring backpack for unlimited adventures. With enough room for storage and a dialed compartment management everything you’d need on tour has its space, exactly where you need it. The Air flow contact system offers an outstanding carrying comfort through maximum back ventilation and absolute load neutrality. The goal is to prevent pressure points even when the backpack load exceeds the recommended maximum weight of up to 10 percent of your body weight, as well as to keep the contact points between body and backpack dry and comfortable. 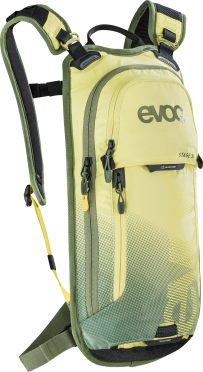 The Evoc Stage 3L + 2L bladder backpack yellow is a compact, technical daypack with an hydration bladder of 2 liter which is enough for an intensive bike ride of 2 hours. With a capacity of 3 liters, the backpack has little space for large items such as an extra pair of shoes or clothing, although the bag is big enough for spare parts, tools or food. Extra convenience comes with the freely moving BRACE LINK, which adapts to the wearer's individual shoulder width. In the development of the STAGE SERIES Evoc has put great emphasis on creating backpacks with sophisticated technical features which provide optimal support, and at the same time form a unit with the bike rider. A secure, body-hugging fit and maximum air ventilation were the key focus, without the backpacks appearing overloaded. 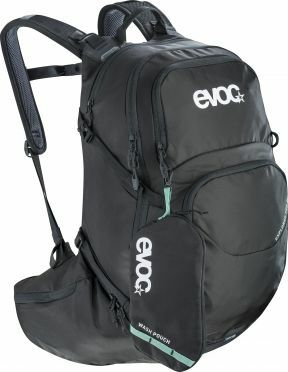 The Evoc Explorer pro 30 liter backpack black is a versatile bike touring backpack for unlimited adventures. With enough room for storage and a dialed compartment management everything you’d need on tour has its space, exactly where you need it. The Air flow contact system offers an outstanding carrying comfort through maximum back ventilation and absolute load neutrality. The goal is to prevent pressure points even when the backpack load exceeds the recommended maximum weight of up to 10 percent of your body weight, as well as to keep the contact points between body and backpack dry and comfortable. 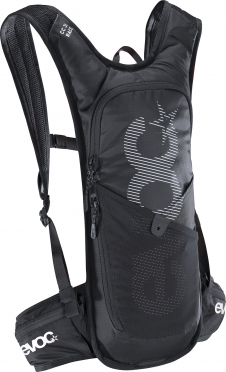 The comfortable Evoc CC race 3L + 2L bladder backpack black is highly recommended for off road cycling and MTB Stay hydrated during the ride thanks to its hydration system which can hold 2 liters of water. The CC race has many different compartments which are all easily accessible. Take advantage of the handy pocket on the shoulder strap for easy access to your nutrition. The Air pad system ensures perfect ventilation of the back while the brace link on the shoulder straps guarantees a good fit. 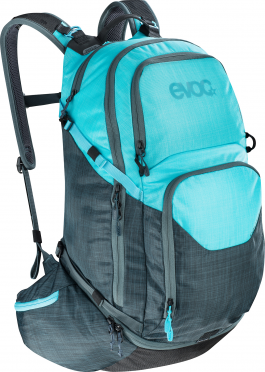 The Evoc Explorer pro 30 liter backpack slate-neon blue is a versatile bike touring backpack for unlimited adventures. With enough room for storage and a dialed compartment management everything you’d need on tour has its space, exactly where you need it. The Air flow contact system offers an outstanding carrying comfort through maximum back ventilation and absolute load neutrality. The goal is to prevent pressure points even when the backpack load exceeds the recommended maximum weight of up to 10 percent of your body weight, as well as to keep the contact points between body and backpack dry and comfortable. 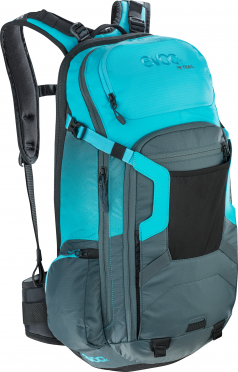 The Evoc FR trail 20 liter slate-neon blue protector backpack comes as a daypack with integrated back protector. 20 litres of capacity and an ergonomic fit make the backpack an absolutely reliable partner on a bike tour. 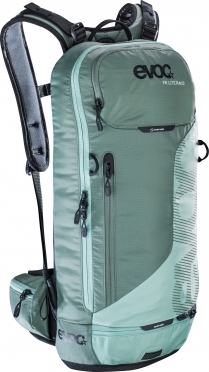 20L daypack for hydration system up to 3L with integrated back protector and rain cover. 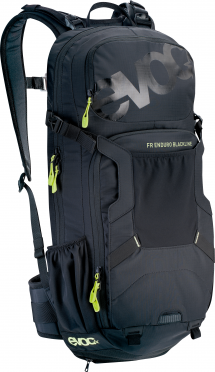 The EVOC FR Enduro blackline 16 liter protector backpack has been specially designed for enduro bike races. Low weight and a completely ventilated carrying system with an AIROFLEX hip belt are the highlights of this race backpack. As an update, this pack received a shorter backpart to minimize helmet contact while riding steeper sections. The EVOC LITESHIELD BACK PROTECTOR combines maximum protection against falls and a feather-light, highly effective construction with a great deal of flexibility. At the same time, it is completely impervious to temperature. 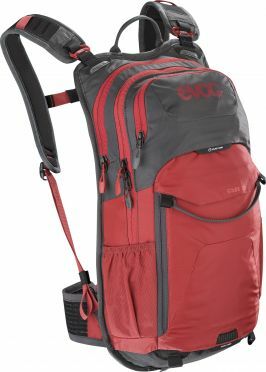 The Evoc Stage 3L + 2L bladder backpack red is a compact, technical daypack with an hydration bladder of 2 liter which is enough for an intensive bike ride of 2 hours. With a capacity of 3 liters, the backpack has little space for large items such as an extra pair of shoes or clothing, although the bag is big enough for spare parts, tools or food. Extra convenience comes with the freely moving BRACE LINK, which adapts to the wearer's individual shoulder width. In the development of the STAGE SERIES Evoc has put great emphasis on creating backpacks with sophisticated technical features which provide optimal support, and at the same time form a unit with the bike rider. A secure, body-hugging fit and maximum air ventilation were the key focus, without the backpacks appearing overloaded. 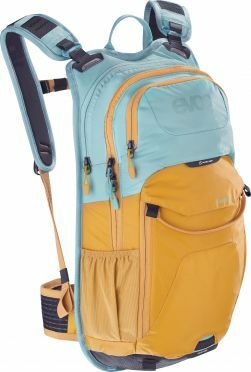 The Evoc Stage team 6L + 2L bladder backpack blue is a compact, technical daypack with an hydration bladder of 2 liter which is enough for an intensive bike ride of 2 hours. The backpack has excellent features and configuration , it is the number one option for those looking to travel light without sacrificing carrying comfort and back ventilation. Extra convenience comes with the freely moving BRACE LINK, which adapts to the wearer's individual shoulder width. 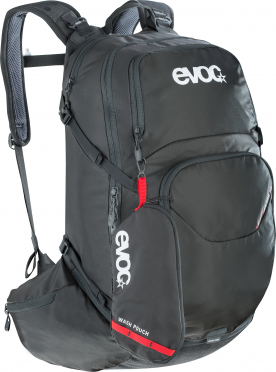 In the development of the STAGE SERIES Evoc has put great emphasis on creating backpacks with sophisticated technical features which provide optimal support, and at the same time form a unit with the bike rider. A secure, body-hugging fit and maximum air ventilation were the key focus, without the backpacks appearing overloaded. The Evoc FR Lite race 10L Backpack olive/light petrol protector backpack has been specially designed for enduro bike races. Low weight and a completely ventilated carrying system with an Airflex hip belt are the highlights of this race backpack. As an update, this pack received a shorter backpart to minimize helmet contact while riding steeper sections. The evoc liteshield back protector combines maximum protection against falls and a feather-light, highly effective construction with a great deal of flexibility.